Recorded on this day in 1929, herein is one of my favorite discs, though the condition is rather lacking, owing to a heavily scratched surface from many years of unsleeved storage. “Smoke Jackson and his Red Onions” is a pseudonym for Zack Whyte’s Chocolate Beau Brummels, a fine Midwestern territory band. The 78 Quarterly estimated “at least 15” copies of this record in their “Rarest 78s” article. While it may likely not be quite that scarce (although there surely are at least fifteen copies), it’s still far from a common disc. Zack Whyte was born in 1898 in Richmond, Kentucky, and attended Wilberforce College, where he played banjo with Horace Henderson’s Collegians. He started leading his own Cincinnati-based bands in 1923, and eventually formed the Chocolate Beau Brummels, a territory band that recorded six sides with Gennett in 1929, and helped to bring several greats including Sy Oliver and Herman Chittison to prominence. Whyte retired from music in 1939 and died in 1967. These two superb sides of Champion 15714 were recorded in Richmond, Indiana on February 26, 1929. This Champion issue sold 9,060 copies. It was also issued on Gennett 6797 and Supertone 9368 under the pseudonym “Eddie Walker and his Band.” The Chocolate Beau Brummels consist of the star-studded lineup of Zack Whyte directing and playing banjo, Bubber Whyte (his brother? ), Henry Savage, and the great Sy Oliver on trumpets, Floyd Brady on trombone, Clarence Paige, Ben “Snake” Richardson, and Earl Tribble on alto saxes, Al Sears on tenor and baritone sax, the always excellent Herman Chittison on piano, Montgomery Morrison on tuba, and William Benton on drums. Beginning with side “A”, the Chocolate Beau Brummels play a stomping rendition of Hudson Whittaker and Thomas A. Dorsey’s (a.k.a. Tampa Red and Georgia Tom) hit “It’s Tight Like That”. I believe this is the second take, and it really gets in the groove. 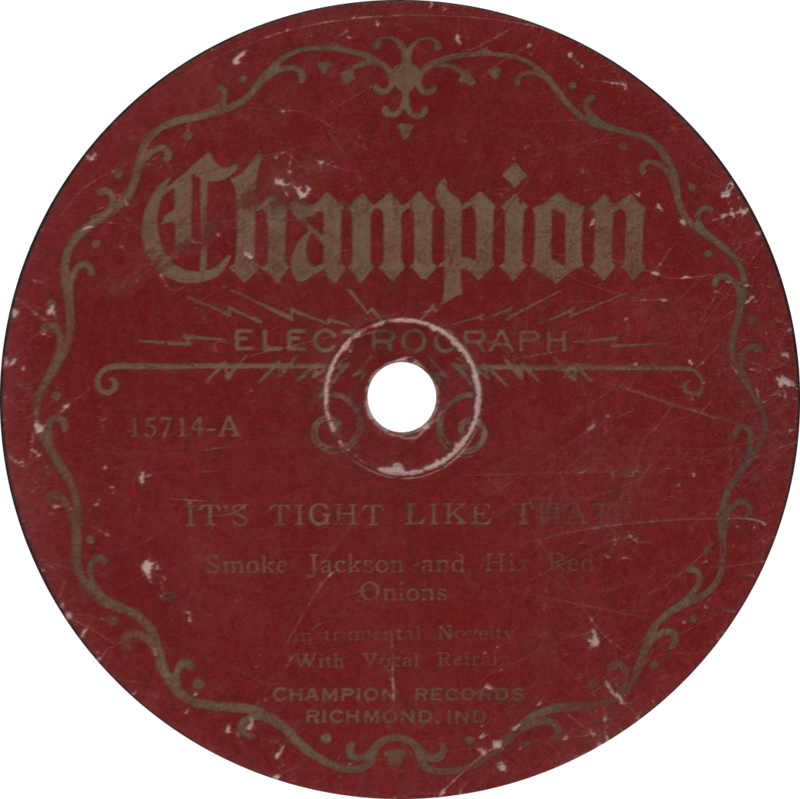 It’s Tight Like That, recorded February 26, 1929 by Smoke Jackson and his Red Onions. A bit worse for wear than the previous, on the flip-side they play a masterful rendition of Joe “King” Oliver’s “West End Blues”, with a beautiful piano intro by Herman Chittison and some fine banjo by the leader. The label splits the composer’s credit between Oliver and publisher Clarence Williams. I believe this one is the third take, but with Gennett’s lack of any identifying marks in the “dead wax”, it’s hard to be sure. 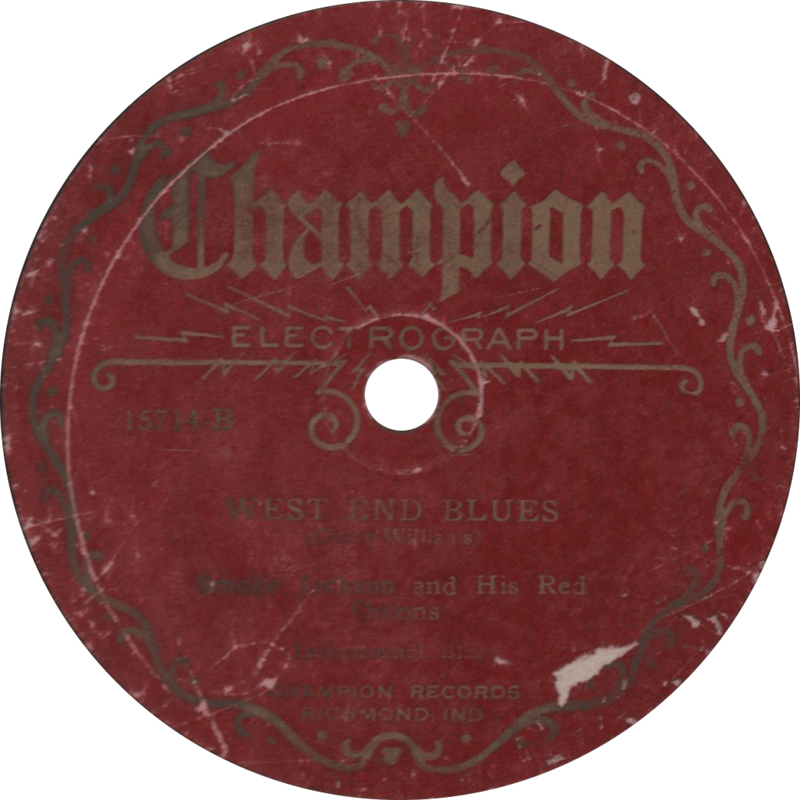 West End Blues, recorded February 26, 1929 by Smoke Jackson and his Red Onions. Updated with improved audio on April 22, 2018. This entry was posted in Records and tagged 1920s, 1929, Al Sears, Blues, Bubber Whyte, Champion, Clarence Paige, Clarence Williams, Earl Tribble, Floyd Brady, Georgia Tom Dorsey, Henry Savage, Herman Chittison, Jazz, King Oliver, Montgomery Morrison, Richmond, Snake Richardson, Starr Piano Co., Sy Oliver, Tampa Red, Territory Band, William Benton, Zack Whyte by R. Connor Montgomery. Bookmark the permalink.